Beauty Blog by Angela Woodward: How do I remove my Fashion Color? Fashion Colors are tricky to remove, even for the most seasoned stylist. A classic color uses ammonia or some other propellant to push the color molecules inside the hair strand. There, they attach themselves to existing pigment molecules and kind of take over. 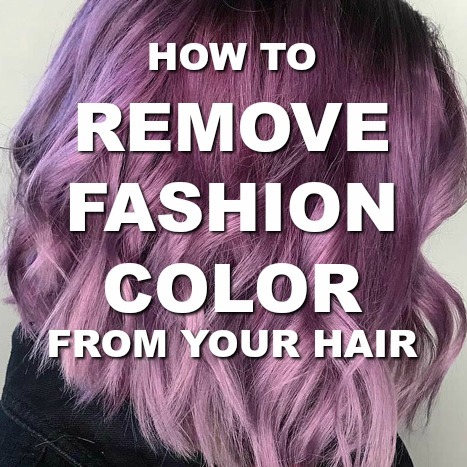 With fashion color you start by pre-lightening the hair. When you lighten (or bleach) the hair color molecules are dissolved and removed. Once there is little to no pigment left in the hair a fashion color is placed on the hair. Fashion colors stain the hair shaft, and do not penetrate into the hair itself. This makes it hard to remove because you are trying to remove a stain as opposed to dissolving or lifting pigment. So I am going to get real nitty gritty about this. As a stylist, this is hard. WE have access to a lot of gentler removal tools and options that the public doesn't. It's hard for me to give DIY advice, because you can ruin your hair so bad if you aren't careful. My best advice? Find a hairstylist or salon that uses Malibu DDL. Book an appointment. For at home, you can use cheap clarifying shampoos on your hair, but be sure to follow those with a mask or conditioning treatment, because they will DRY your hair out. This could aid in initial fading though improving the result of a treatment. Please do not use Color Oops or The One and Only Color Fix. These are basically low developer bleaches. You can tell because when you apply them, your natural pigment on hair that you haven't colored will lift as well as your fashion shade. It does more damage and the lightener can actually drive some of the fashion shade into the hair shaft which could cause underlying pigment issues if you want to apply a new fashion shade or if you want to begin the regimenting process to go dark again.